There are various CD players in the market that play both MP3 files and other digital files. But what if you had a CD player that was CD-R/RW Compatible built-in with an AM/FM receiver? 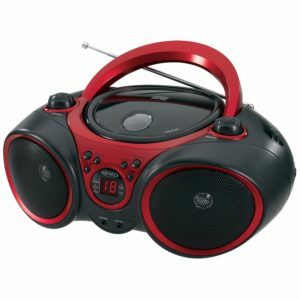 The Jensen CD-490 Bestselling Boombox offers that plus more. This is a player created by Jensen to fit your lifestyle. Although this is not the biggest brand when it comes to electronics, it surely is a force to reckon with considering the great positive reviews its products have received. There are concrete reasons why people who have lots of burned CDs prefer this player. So here is a look into the Jensen CD-490 Boombox. One thing that makes the Jensen CD-490 Boombox stand out is the fact that it is a CD-R/RW compatible and comes with a LED CD track display to show you exactly how your CD player is responding. When it comes to controls, there are useful buttons to add more fun to your experience. For instance, you can skip or search a track, forward, go back, repeat 1 or all tracks and better still, enjoy a programmable memory. But if you have had enough with the CDs and want to listen to something unique from your favorite radio station, the Jensen CD-490 Boombox has an AM/FM stereo receiver to help you achieve that. The telescopic antenna ensures that you get nothing but clear and undisturbed receivership anywhere anytime. Speaking of playing music anywhere, you can change the way you are used to listening to a CD player thanks to the stereo headphone jack. This allows you to plug in your earphone or headphone and get closer to the beat than before. Also, the aux input adds value to this device. This allows you to connect your iPod, MP3 or other digital audio players. This is just the perfect feature that will let you enjoy your tunes on the go. The style is the other thing that makes the Jensen CD-490 Bestselling Boombox stay at the top. Normally, people will tend to get confused on the best CD player to pick from the shelves. However, the CD-490 stands out when it comes to style. So choosing it shouldn’t be a problem. It has a sporty look with a foldable carrying handle that complements its entire look. There is more than just the handle. This radio comes in four different colors to match your personality. And if you love curves, you will love the curviness of the Jensen CD-490. The soft eject CD cover is like no other. It has a glossy finish that adds class to the general look of the player. The player has a 2-way power: DC battery power and AC power. This means that you will still be able to listen to your favorite jams even when the lights go off or when you are in the outdoors where there is no electricity. It has always been the vision and mission of Jensen to create the finest quality consumer electronics products and embrace what the latest technology has to offer. That can be seen with the dynamic high-performance speakers. So what you get is crystal clear sound. One of the main disadvantages of this player is its size. As much as it is considered a portable music player, the Jensen CD-490 Boombox is not small enough to fit into your pocket like other music players. So this may not be the best electronic device to carry when traveling and you have a limited space. Also, the auxiliary cable for connecting your iPod, MP3 or other digital audio players to the Jensen CD-490 Boombox is not included. So this means you will have to go an extra cost to purchase the cable if you want to use your other digital audio players. Considering the many great features you stand to enjoy with the Jensen CD-490 Boombox, there is every reason why you should get yourself one from the shelves. The user interface is something you will not get in most portable CD players. Also getting a player with a built-in AM/FM tuner and with such a low price not easy. Although there are a few cons that come with this player, they don’t affect the overall performance of this player. So the Jensen CD-490 Boombox is worth your money.